Located at the base of the grand staircase. 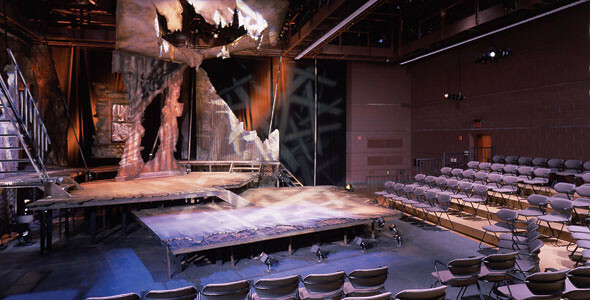 The Robert & Arlene Kogod Theatre is a multi-purpose, flexible black box theatre. With its theatrical lighting system and various theatre seating configurations, the Kogod Theatre is a versatile space for performances, workshops and special events, including receptions and seated dinners. Robert and Arlene Kogod are among a distinguished group of arts philanthropists who embraced the vision of the Clarice Smith Performing Arts Center and provided significant support to realize the dream in 2001. Motivated by their passion for the performing arts, particularly theatre, they named the multi-purpose, black box theatre and continue to provide annual support for the Center’s programs, including a variety of theatre productions that occur each year in the Robert & Arlene Kogod Theatre. For technical specifications of the Kogod Theatre, click here. Screening of and Panel Discussion on "THE UNAFRAID"